Century Cycles Blog: Ride and win with the Summit Metro Parks Summer Biking Spree! 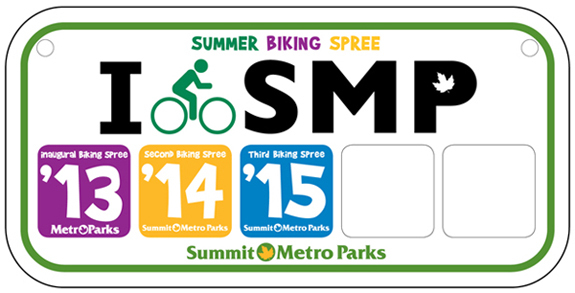 Ride and win with the Summit Metro Parks Summer Biking Spree! Go out and RIDE during the 3rd annual Summer Biking Spree, brought to you by the Summit Metro Parks! Participants of this at-your-own-pace cycling event who complete five different sections of the multipurpose trails managed by Summit Metro Parks (the 34-mile Bike & Hike Trail, the 6.2-mile Freedom Trail in Tallmadge, and 22.4 miles of the Towpath Trail in Summit County) between July 1 and August 31 can earn spree rewards: a bicycle license plate and reflective sticker for first-year riders, and a reflective sticker for veteran riders. One lucky spree participant – drawn at random from submitted forms – will win a new Raleigh bike from Century Cycles. The drawing will be held October 16. The number of completed forms will determine the odds of winning. Find spree forms at Century Cycles in Peninsula and all Acme Fresh Market locations. For more information, visit summitmetroparks.org or call 330-865-8065.